Here are some of the latest press releases from the people we work with. If you’re a journalist, blogger or writer and would like more information, images or samples, please get in touch. Hand-crafted during the first burst of summer, Elderflower Clothbound Cheese from Devon-based cheesemaker, Quicke’s is a seasonal cheese like no other. Combining early summer’s grass-fed cow’s milk with the elder tree’s botanical bloom, this 6-month matured cheese is a joyous celebration of the land at this special time of year, from the lush pastures to the hedgerows that weave their way around Home Farm. A truly unique cheese, born from a desire to make the most of nature’s larder, Elderflower Clothbound Cheese owes much to the ageless hedgerows that the Quicke family has maintained since the sixteenth century. Working with local foragers to greedily gather the spoils from this ancient plant, Quicke’s then blends the elderflower into the cheesemaking process to achieve a fresh, buttery cheese with delicate floral notes. Steeped in tradition while breaking the mould, Quicke’s Elderflower Clothbound Cheese can bring a taste of the British summer to the table, whatever the time of year. Rich and aromatic, the cheese finds a perfect pair in a cool glass of Prosecco, better still enjoyed during a hazy sun-drenched picnic along with charcuterie and pickles. Quicke’s Elderflower Clothbound Cheese is available to purchase from www.quickes.co.uk (200g £5.30, 500g £12.00), as well as from many independent retailers across the UK. On Monday 11 March, the Guild of Fine Food crowned the UK’s best independent retailers, as Shop of the Year 2019 reached its exciting finale. Established to recognise and promote excellence in independent retail, the rigorously judged accreditation scheme presented seven trophies at Fodder Farm Shop and Café in Harrogate, where the world of fine food gathered to find out the winners of each category. Following two rounds of judging, which included an announced visit from one of the expert judges and a mystery shop by customer experience specialists, Insight6, Leamington Spa-based Aubrey Allen won the Delicatessen & Grocer category, Sheridans Cheesemongers in Dublin scooped best Specialist Cheese Shop and Perthshire-based The House of Bruar was named winner of the Food Hall award. Representing the North of England, Farmer Copleys in Pontefract took top honours in the Farm Shop category, while the trophy for Specialist Food or Drink Shop went to Gateshead-based Block & Bottle. Visiting 45 finalists on the hunt for this year’s independent retail stars, the panel of judges found excellence in every corner of the UK before giving out the gongs. The winners ranged from community-focused family businesses like Aubrey Allen, which was established in 1933 and shone through with its “balanced retail flow, where shoppers can stock up for a dinner party, while also grabbing something for lunch”, to pioneers of Irish cheese, Sheridans Cheesemongers, described as “key to the growth in farmhouse cheesemaking in Ireland.” Applauded by the judges for “bringing really good quality cheese to a wider audience”, Sheridans received high praise on everything from its biodegradable packaging and materials to its work with key suppliers to create unique cheeses. Stocking a wide range of meat and vegetables reared and grown on the family-run farm, alongside locally sourced produce and pies, baked goods and ready meals made on site, Farmer Copleys was praised for staying “true to its roots, while engaging with the local community and hosting an ‘exciting’ line up of seasonal events”, while The House of Bruar was commended for its ‘‘delightful, attentive and knowledgeable staff”, as well as its “impressive smoked salmon display, exemplary butchery skills and range of successful brands”. Opened in 2017, Block & Bottle caught the judges’ attention with an impressive range of local, national and international craft beer and meat from within a 60-mile radius. The “concept, execution and energy” of owners Katie and Stephen came in for special mention, with judges dubbing them an “inspirational and entrepreneurial couple with spirit and compassion”. From overall shopping experience and financial performance to staff training opportunities and environmental initiatives in place, the panel of judges, which includes Edward Berry of The Flying Fork, Stuart Gates, former managing director at Fortnum & Mason and senior buyer at Harrods, award-winning retailer Tracey Colley and food writer, Patrick McGuigan, rated, scored and provided feedback on every aspect of the shops before agreeing on an overall category winner. Shop of the Year 2020 is now open for entry at gff.co.uk/awards/shop-of-the-year, with independent retailers across the UK invited to submit a written submission for the following categories; Delicatessen & Grocer; Specialist Cheese Shop; Farm Shop (farmer owned); Food Hall; Specialist Food or Drink Shop. For more information about Shop of the Year, visit gff.co.uk/awards/shop-of-the-year. Cheese-lovers can now delve deeper behind the rind and become an Associate of the Academy of Cheese by completing the School of Fine Food’s Level 1 course in their spare time. Introducing its first Saturday course and an evening course run over three weeks, the London-based School of Fine Food, which is run by the Guild of Fine Food, is giving more people the opportunity to expand their cheese knowledge and gain a recognised qualification. Taking the first step on a journey to become a fully-qualified Master of Cheese, students will cover cheese making, provenance and terminology, as well as taking part in a comprehensive tutored tasting of 25 different cheeses. Designed to help curate an epic cheese board at home or develop a career behind the counter, the fun hands on course is supported by a wealth of cheese-related literature to assist with a little home study and lots more tasting, before students complete their online certification. The Academy of Cheese Level 1 Associate course costs £195 and is held at No. 42 Southwark Street, the School of Fine Food’s London home near Borough Market. One-day courses run from 9:30am to 5pm and will take place on the following dates; Saturday 6 April, Thursday 20 June, Wednesday 18 September and Wednesday 6 November. The evening course will run over three consecutive weeks on Tuesday 11, 18 and 25 June from 6:30pm – 9pm. For more information, visit www.gff.co.uk/cheesecourse. Smooth, rich and miles from mild, Buttery Clothbound Cheddar from Quicke’s is a grass fed wedge that celebrates the best of Devon’s lush pastures. Full of the character and depth that is often associated with more mature cheeses, this youthful and vibrant cheddar reflects the cheesemaker’s many years of care and respect for the land, a corner of England that the Quicke family has nurtured for 14 generations. Guided by the ethos, ‘farm like you’re going to live forever’, Quicke’s has farmed in harmony with its ancient environment since the 16th century, more recently evolving practices in pursuit of great cheesemaking with the help of modern research and technology. An age-old respect for nature, combined with the introduction of advances such as the kiwi grazing system and specially bred hybrid cows, have led to outstanding milk for cheesemaking, capturing the best expression of the grass, soil and seasons. Full of the rich creaminess and intensely buttery flavour that is found at the early stages of the maturing process, Buttery Clothbound Cheddar is ready to challenge any cheese lover who thinks top class cheddar must be mature. It may be the baby of the Quicke’s range, but this award-winning wedge owes much to centuries gone by and the spirit of slow at Home Farm that will ensure the land and the cheeses will be around for many years to come. Quicke’s Buttery Clothbound Cheddar is available to purchase from www.quickes.co.uk (200g £4.25, 500g £8.70, 1.5kg £25.00), as well as from many independent retailers across the UK. GAIL’s Bakery and Quicke’s are now working together to ensure that nothing from the Devon-based cheesemaker’s Clothbound Cheddar goes to waste. With Cheddar, whey butter and offcuts all incorporated into the London bakery’s menu, the bread heads at GAIL’s have now revealed the first batch of recipes inspired by the cheesemaking process. Beginning with the need for a singularly special slice of cheese for its epic Ham & Cheese Sandwich, GAIL’s has combined Quicke’s Buttery Clothbound Cheddar with roasted ham, mustard butter and its French Dark Sourdough. With the core of the truckle removed to achieve a perfect slice and crumbly bits set aside along the way, GAIL’s has also created a new Cheddar Sourdough Stick to put these cheesy chunks to good use, with the number produced depending on how many Ham & Cheese Sandwiches get sold. Not content with making use of the whole wheel, the craft bakery is also topping its toast with Quicke’s Whey Butter. Made using a rare heritage recipe and recognised by the Slow Food UK movement as one of the nation’s great ‘Forgotten Foods’, the butter combines the finest milk from Quicke’s grass-fed cows with whey cream, a by-product of the cheesemaking process which many drain away. This latest waste cutting initiative comes just months after GAIL’s launched the UK’s first loaf made using leftover bread in October. The Waste Bread sourdough, made by turning surplus bread into a porridge which is then added into the dough, represents the company’s ongoing commitment to sustainability and the reduction of food waste. United by a shared respect for food and the land which provides, Quicke’s and GAIL’s are committed to making the most of Home Farm’s award-winning Cheddar, a lovingly crafted cheese made from the ground up. With a slice of Devon now firmly behind the counter in bakeries across London, more recipes are set to be announced soon. GAIL’s Ham & Cheese Sandwich and Cheddar Sourdough Stick, both made using Quicke’s Cheddar, are available to buy from its 48 bakeries across London, as well as online at gailsbread.co.uk. Quicke’s Cheddar can be purchased from www.quickes.co.uk. Mike Burks, managing director of The Gardens Group, will become chairman of the Garden Centre Association (GCA) in January 2020, heading up the trade organisation which represents nearly 200 garden centres nationwide. Elected by members of the GCA, Mike will work alongside the GCA executive and full board of elected directors to continue the association’s work in building relationships and promoting best practice across the industry. The Garden Centre Association announced its Chairman elect for 2020/2021 at its annual conference, which was held at the Luton Hoo Hotel on Wednesday 23 January. For more information about The Gardens Group, visit www.thegardensgroup.co.uk. One of the UK’s most respected cheesemakers, Quicke’s will launch its first ever mixed milk cheese into several Whole Foods Market stores later this month, with stores across the US set to stock wedges of the 6-month matured clothbound cheese, Lady Prue. Named after Mary Quicke MBE’s mother, who built the original cheese dairy in Devon, England during the 1970s, Lady Prue has been created exclusively for the US market. Combining goat’s and cow’s milk to produce a youthful, pale and delicate cheese, with a subtle taste of goat and a gentle caramelly hint, the cheese has already landed its first major international award, winning a Silver at the World Cheese Awards in November 2018. Joining Whole Foods Market’s extensive line-up of cheeses from around the world, Quicke’s newest cheese will be available from stores in the Pacific Northwest, South, North Atlantic, Mid-Atlantic, Midwest and Northern California. One of only a handful of mixed milk cheeses currently being made in the UK, Lady Prue embodies both Quicke’s rich heritage and its continued dedication to experimentation and innovation, bringing a true taste of Devon to cheese counters across the country. For more information about Quicke's, visit www.quickes.co.uk. The World Cheese Awards will visit Italy for the first time, taking place in Bergamo on Friday 18 October 2019, as part of the city’s annual FORME cheese festival. 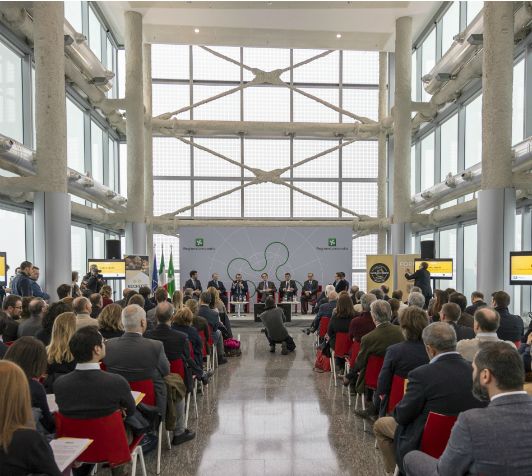 Announced on Thursday 17 January at a the Palazzo Regione Lombardia in Milan, the main seat of the government for the Lombardy region, the news will see the planet’s largest cheese-only competition join a four day celebration of cheese in the Medieval heart of Bergamo. Following an epic edition of the World Cheese Awards in Bergen, Norway in November 2018, where records were broken across the board with 3,472 cheeses from 41 different countries being judged in a single day, the 32nd edition will now be staged in the Capitale Europea dei Formaggi. Reaching out to cheesemakers and cheese experts in every corner of the globe, this year’s line-up is set to be bigger and more diverse than ever before. As Bergamo plays host to the international cheese community, the World Cheese Awards will shine a spotlight on Lombardy’s culinary culture, giving the region’s producers an opportunity to showcase their food and drink on a world stage. The FORME festival itself will take consumer and trade visitors on a dairy journey, featuring tastings, panel discussions, training sessions, markets and an exhibition of all 50 Italian DOP cheeses. The World Cheese Awards will take place on Friday 18 October 2019, forming part of the FORME festival, which will run from 18-20 October across a number of Bergamo’s most iconic venues. For more information about the World Cheese Awards, visit www.gff.co.uk/wca. On a mission to find the UK and Ireland’s future stars of food and drink, The Seed Fund will open for entry on Friday 1 February, offering 12 places on its summer Academy run in partnership with Great Taste, the world’s most coveted food awards. Open to award-winning start-ups and part-time producers alike, The Seed Fund is looking to unearth the hedgerow harvesters, rooftop beekeepers and back garden brewers who are ready to take their budding businesses to the next level. The Seed Fund will be open for entry from Friday 1 February until Monday 1 April. To apply, visit www.theseedfund.co.uk. Distinguished Devon-based cheesemaker, Quicke’s will open its gates for a series of Cheese Tours in 2019, offering curd nerds the chance to meet its world famous cows, witness cheddar being made first-hand and explore the closely guarded ‘Cathedral of Cheese’ where huge truckles come of age. Hosted by Quicke’s ambassador, Stuart Dowle, eight tours will be held between April and September next year. Visitors will learn about grass, the art of grazing and the unique macrobiotics of Home Farm’s soils, discovering how Quicke’s cheese is made from the ground up to become a true expression of the land from which it came. Meeting cheesemakers with over a century of experience, the group will look on as world-class milk becomes award-winning cheddar with the help of heritage starters, natural rennet and Cornish Sea Salt, before heading across the farmyard to the cheese stores to take in the awe-inspiring sight and smell of hundreds of cheeses stacked high. Following an education in grading, mould gardens and the maturing room’s unique microflora, it will be time to tuck into a tutored tasting. Having worked up an appetite around the farm, the tour will end with lunch at Devon’s oldest working brew pub, The Beer Engine in Newton St Cyres, with plenty of Quicke’s clothbound best on the menu. 9.30am - Meet at Home Farm in time for a 10am start. Welcome talk from Stuart Dowle. 10.30am - Take a tour of the dairy, watching the cheesemakers craft each truckle by hand. 11.00am - Whizz around the cheese stores and see how Quicke’s ages its clothbound cheddar. 11.30am - Tuck in to a tutored tasting. 12pm - Take a guided tour of Home Farm and meet the world famous Quicke's cows. 1pm - Explore the farm shop and then visit The Beer Engine for lunch. Tickets to the Quicke’s Cheese Tours cost £35 and can be booked online at www.quickes.co.uk/pages/cheese-tours or by calling 01392 851 222. As cheeseboards are planned and Christmas trees adorned, the celebrations have already begun at Home Farm, as Quicke’s marks its 45th anniversary. Many seasons have passed and truckles been traded since the first cheese left the dairy in 1973, but the Devon-based cheesemaker continues to be guided by tradition, innovation and respect for the land that the Quicke family has nurtured for almost 500 years. Beginning in the early 1970s as milk prices fell, Mary Quicke’s parents, Sir John and Prudence Quicke, became inspired by the cheesemakers that they were selling their milk to and set their sights on producing “something unique, something akin to chateau-bottled wine instead of a commodity.” Sir John’s work in London meant that it was Prue who would establish the dairy, find a cheesemaker and sell the cheese, before eventually handing over the reins to Mary Quicke MBE following her return to the farm in 1984. Bringing her experience of journalism in London, as well as a year working on a cheesemaking farm in Shropshire in 1982 and completing a Diploma in Farm Management at Seale-Hayne College in 1983, Mary was ready to make her mark in cheese. Working in the soft boundary between admiration and partnership with the land, Mary has overseen huge steps forward in the ensuing decades, from the switch to specially bred hybrid cows and the introduction of the kiwi grazing system to the development of an eco-friendly cheese mite management system that employs a high-pressure blower to blast the mites off Quicke’s clothbound cheese. As the nation continues to diversify its diet, discovering fresh world flavours and opting for more meat free meals throughout the week, Pipers Farm’s Grass Fed Beef Topside, a classic roasting joint laced with a fine-grained texture and flavour releasing bite, remains King of the Sunday lunch table. Slow grown and 100% grass fed, this wholesome and nutritious beef can be enjoyed by the whole family with assurance that it has been produced in harmony with nature. Spending their entire lives outside, the native Red Ruby Cattle are perfectly suited to the Devon landscape and its natural resources. The calves build up their natural immunity free from antibiotics with a diet of mother’s milk, which is converted from rough native pasture and heather. Once this milk source dries up after nine months, the ruminant Red Ruby Cattle enjoy a natural diet of forage, herb-rich grass and hay. This 100% grass-fed diet ensures a healthy gut, feeding their own microbiome as well as helping the cattle play a vital role in the cyclical maintenance of the land, grazing the pasture while nurturing the soil and providing food and habitats for insects in the process. Once the Red Ruby Cattle reach natural maturity around 31-36 months old, as opposed to the industrialised method where cereal, grains and chemicals are fed to the cattle to speed up the growing process, they are taken to a local family-run farmyard-based abattoir. The entire carcass is then hung on the bone for at least four weeks, a time-honoured technique, which develops an intense depth of flavour and mouth-watering texture. Served alongside golden potatoes, roasted in Pipers Farm’s Free Range Goose Fat, fluffy Yorkshire Puddings and seasonal vegetables all drizzled in homemade gravy using Pipers Farms Pure Beef Stock, the Grass Fed Beef Topside can provide the centrepiece for a delicious, nourishing and truly traditional Sunday roast with minimal impact on the environment. Pipers Farm’s Grass Fed Beef Topside is all available to order from www.pipersfarm.com, £21 per kg. Photo credit: Tim Johnston Photography. Distinguished Devon-based cheesemaker, Quicke’s has landed three honours at the World Cheese Awards in Norway, standing out from the crowd among a record-breaking field of 3,472 entries from 41 different countries that were judged in Bergen on Friday 2 November. Continuing its impressive run of awards success, Quicke’s Goat's Milk Clothbound Cheese took a Gold following the blind-tasting judging process, joined by Mature Clothbound Cheddar which also achieved a Gold rating. New for 2018, Lady Prue impressed the panel too, with the youthful and delicate mixed milk cheese winning a Silver during its first appearance at the competition. Mary Quicke MBE and Tom Chatfield, head of sales and marketing at Quicke’s, joined a 235-strong team of judges from 30 different countries at the planet’s largest cheese-only event, which took place at Bergen’s iconic Grieg Hall in the heart of the city. Having flown the flag for Devon as the global curd community gathered in Norway for the 31st edition of the competition, Quicke’s has once again been recognised as one of the world’s top cheesemakers. Fanaost, an aged gouda made by Norwegian cheesemaker, Ostegården, has been named World Champion Cheese at the 31st edition of the World Cheese Awards in Bergen, Norway. Produced from a herd of just 12 cows on a farm less than 20km from Bergen, Fanaost rose to the top among a record breaking 3,472 entries judged in a single day at the city’s iconic Grieg Hall. This truly artisan cheese stood out at every stage of the blind tasting process on Friday 2 November, as the competition visited Norway for the first time to form part of the brand new food festival, Matnasjonen Norge, in partnership with HANEN. Beating finalists from countries including Italy, France, Israel and South Africa in the final 16, cheesemaker Jørn Hafslund was in attendance to claim his trophy and receive a rapturous reception from the home crowd. The rest of the International Super Jury, representing nations including Brazil, Japan, Russia, Norway and Spain, concurred, awarding Fanaost the highest score of the final judging stage. Fanaost was awarded 71 points out of a possible 80 by the Super Jury of 16 judges, ahead of two cheeses in joint-second place with 65 points; Agour Pur Brebis AOP Ossau Iraty from France, made by Fromagerie Agour and entered by QST International Limited; and Helfeit, Brun Geitost – Tinntradisjon, a traditional brown goat’s cheese from Norway, made by Stordalen Gardsbruk. A quick loaf that’s packed full of texture and flavour, Gill Meller’s Cheddar and Whey Hazelnut Soda Bread recipe has been created with autumn’s bounty in mind. The latest in a series of seasonal recipes developed by Gill using Quicke’s award-winning clothbound cheese, the soda bread takes inspiration from all corners of this ancient Devon landscape, from the dairy and ancient woodlands to Mary Quicke’s own back garden. Taking just 45 minutes to prepare, this is a recipe designed for the busiest of seasons, a time of harvesting, gathering and preparation for the months ahead. Beneath a golden cheesy crown, made using Quicke’s Buttery Clothbound Cheddar, the bread is crammed with sweet roast red onions and rosemary from the garden, along with bashed hazelnuts and jumbo oats to give the most satisfying of bites. All brought together using whey left over from the cheesemaking process, this loaf sets out to make the most of what the pastures provide. Following the publication of Gill’s latest book, Time, which moves through the seasons with recipes created for morning, daytime and night, this new soda bread recipe is firmly rooted in autumn at Home Farm. Just as the milk shifts with the changing seasons, giving new complexities to truckles entering the cheese stores for anything from three up to 24 months, minds turn to feasting, comfort and shelter as the colours change across Home Farm. Created to tell help tell the story of the land as autumn brings about shorter days and thicker jumpers, Gill’s recipe is a warm invitation to gather with friends and hunker down with a good hunk of bread. The recipe for Gill Meller’s Cheddar and Whey Hazelnut Soda Bread can be found at www.quickes.co.uk/blogs/recipes. Devon-based online butcher, Pipers Farm has launched a new range of Handmade Pies this week, bringing wholesome lunches, hearty snacks and simple suppers for the whole family to enjoy. With crisp buttery pastry and the finest natural ingredients, including generous chunks of moreish slow-grown and grass fed meat, which has been traditionally farmed in harmony with nature, these rustic pies are now available for home delivery nationwide. Taking inspiration from classic recipes, Pipers Farm has created four regular fillings, including a Steak and Otter Ale Pie crammed with its nutritious and award-winning Red Ruby beef and root vegetables, immersed in local ale gravy. Slow grown and grass fed for their entire lives, the native Red Ruby cattle build up a natural immunity from their mothers’ milk without the need for antibiotics, before playing a vital role in the cyclical maintenance of the land, grazing the pasture while nurturing the soil and providing food and habitats for insects in the process. Other recipes make use of hand-picked cuts from across the farm, including the Chicken and Ham Pie which combines two of Pipers Farm’s most celebrated meats. The Butter Chicken Pie puts poultry centre stage, championing the Properly Free Range Chicken that provided the cornerstone for Pipers Farm when it was founded over 30 years ago, while the Pumpkin, Goat’s Cheese and Spinach Pie delivers a hearty vegetarian option that makes the most of autumnal abundance. Suitable for home freezing, the Handmade Pies are best cooked from frozen and take a total of 40 minutes to cook. Served warm with seasonal vegetables or cooled overnight for the next day’s lunchbox, the new pies from Pipers Farm are designed with modern family life in mind. Pipers Farm’s entire range of Handmade Pies are all available to order from www.pipersfarm.com, RRP £3.95. Golden, plump and juicy, a Pipers Farm Properly Free Range Goose, which is slow reared especially for Christmas and New Year, can be the crowning glory of any festive dinner table. A Christmas favourite for centuries gone by and a popular alternative to turkey, the Devon-based online butcher’s free range goose makes for truly traditional fare and can feed the whole family and more, with succulent, seasonal and nutritious meat, which has been reared in harmony with nature. Hatched in April and slow grown on a two-generation-run farm tucked into a steep Devon hillside, the properly free range geese enjoy a natural diet and plenty of space to flap, fly, scratch and honk. Once the birds reach natural maturity in late November they are slaughtered, dry plucked by hand and hung for 12 days, time-honoured methods honed to perfect that unmistakable texture and rich lingering flavour. Stuffed with roughly chopped prunes, Bramley apples and onions, then served with seasonal vegetables and gravy made from the giblets, alongside wonderfully fluffy roast potatoes cooked under the goose to catch the delicious fat, this Properly Free Range Goose will make a grand centrepiece this Christmas or New Year. For smaller gatherings or last minute get-togethers, the Free Range Goose Breast and Free Range Confit Goose Leg deliver those same comforting and indulgent flavours, leaving more time to take on the nibbles, dessert and wine. Pipers Farm’s Properly Free Range Goose, which includes the giblets for making stocks and gravy, the Free Range Goose Breast and the Free Range Confit Goose Leg, are all available to order from www.pipersfarm.com for delivery after Monday 10 December. A cheese shaped by every corner of the Quicke’s estate, the award-winning Oak Smoked Clothbound Cheddar can bring a true taste of Devon to this year’s Christmas festivities. Combining a subtle smoke with the cheesemaker’s distinctive buttery cheddar, this is a wedge ready to shake up the Christmas cheeseboard, pair up with the drinks cabinet and bring homely flavours and aromas to a range of recipes. Beginning with the grass out on the pastures of Home Farm, an unadulterated Devon diet for Quicke’s world-famous hybrid cows, this lush resource provides milk like no other for the dairy. A true taste of the land from which it came, this milk is then combined with natural rennet, heritage starters and Cornish Sea Salt to create the cheese’s unique flavour profile. Wrapped in cloth and moved onto the maturing rooms for 9-12 months, the farm’s unique microflora impacts upon its taste, texture and appearance as the cheese slowly comes of age. Venturing around the farm more than most, the Oak Smoked Clothbound Cheddar is finally cold smoked using oak chips from trees grown in the ancient woodlands of the Quicke’s estate, which have been dried for many months in an old barn nestled in the farm’s winding lanes. Making the most of every gift that the landscape has provided, this is a smoked cheddar that’s worth the wait, pairing well with Devon tipples ranging from Sandford Orchards’ Devon Red Cider to Lyme Bay Winery’s Damson Liqueur. Quicke’s Oak Smoked Clothbound Cheddar is available to buy at selected Marks & Spencer and Whole Foods Market stores, as well as from many independent retailers across the UK. The cheese can also be purchased from www.quickes.co.uk; 200g £4.75, 500g £11.10, 1.5kg £30.00.